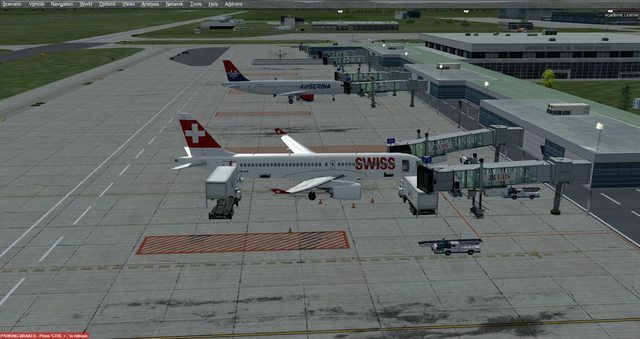 This is for the former commercial scenery of Belgrad Nikola Tesla Airport from Skyhighsim. The scenery is now freeware, but I don´t know, where to get it. I bought it once so I still have it. It runs under P3D4.5 but has some flickering landing lights. I could fix it, removing the special lights added here and replacing them with default lights. lybe-xnkjyz.ini goes to the C:\Users\Username\AppData\Roaming\Virtuali\GSX folder. 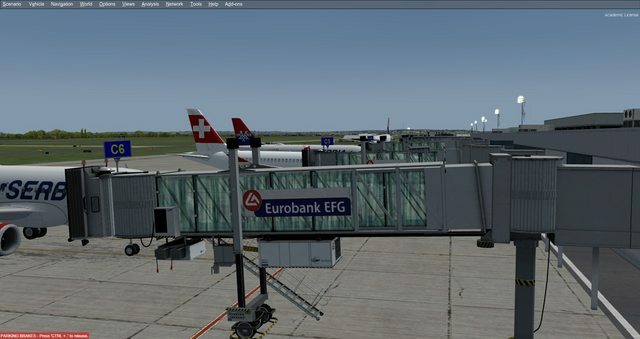 LYBE_ADEX_RT.BGL has the jetways removed and added parkings for bus and fueltruck from GSX. You can also leave the ADE untouched by just disabling the jetways library BELGRADE-TERMINAL-LIB.bgl. Just rename it to .off. There´s no need for a exclusion file, respectively this method does not work with this scenery. Replacement of LYBE_ADEX_RT_CVX.bgl. Only to use if you disable the Sat scenery BGD-FOTO.bgl. This does not match the surroundings from ORBX EU LC unfortunately. So I renamed it to .off. If you have questions, suggestions write in this thread. Here again Belgrad LYBE with GSX/Sode Jetways and the correct logos from Eurobank. Sim.cfg Attention!!!! If you already have custom logos, you have to copy paste the entries 469 to 478 and renumber them. If you update GSX, then everything will be gone again. So keep a backup to quickly add it again. Also updated ADE and CVX file especially needed if you disabled the satellite image. It matches now much better. This happens only because you made edited the GSX default objects, instead of following the recommendation in the PaintKit doc, which suggests to customize only the objects in the PaintKit _USER folders, and never the actual GSX objects. These are the folders name of the GSX DEFAULT Objects which can be customized with the Paintkit. You are shouldn’t alter these, and it’s not really recommended, because the default object will likely be updated and overwritten either by newer versions of the GSX installer, or if you simply need to reinstall GSX, so you’ll lose all your repaints. With the PaintKit we are distributing a new set of identical folders, named just like the original ones, but with a _USER suffix added at the end of the folder name. For example, if a default Catering vehicle folder is named FSDT_Catering_EU, the “Paint-Kit” version of it, will be located in the FSDT_Catering_EU_USER folder, you’ll find these folders in the FSX\Simobjects folder after installing the PaintKit. This way, you can do all your experimentation in the _USER folders, without worrying about touching the default GSX objects, or losing your modifications in case GSX will be updated/reinstalled. We strongly suggest stick to this convention, and operate in the _USER folders only. In any case, in the next update, the PaintKit won't be used anymore in P3D4, and making custom logos will be way easier.